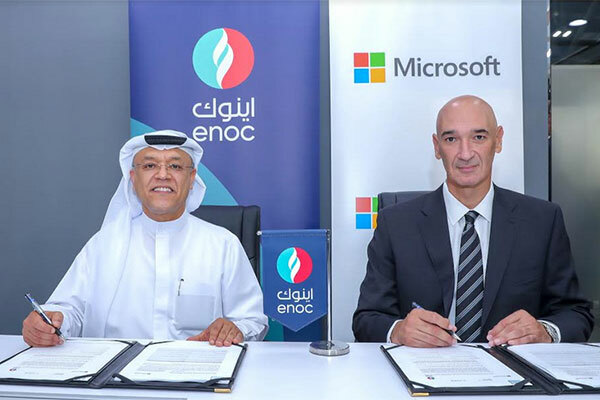 Enoc Group (Emirates National Oil Company), wholly owned by the Government of Dubai, has partnered with Microsoft to design and develop an artificial intelligence (AI)-powered service station. The memorandum of understanding was signed by Zaid Alqufaidi, managing director, Enoc Retail and Sayed Hashish, regional general manager, Microsoft Gulf. The Service Station of the Future concept centres on the digital transformation of the forecourt, thereby enhancing the consumer experience. By linking Enoc services with mobile apps and leveraging artificial intelligence, customers enjoy a personalised and convenient experience that includes directing them to less busy stations on their routes and reducing their waiting time at the pump. Customers will also enjoy a personalised experience as they get products and services recommended to them based on their preferences and get them delivered to their cars while they refuel. Enoc will select a single service station to serve as a pilot. “Dubai has witnessed transformational growth over the past years, largely driven by the emirate’s ability to adopt innovative technology solutions to spur its development,” said Saif Humaid Al Falasi, Group CEO, Enoc. “Key institutions continuously strive to achieve excellence, and Enoc is proud to play a major role in this success story. With operations spanning the entire energy value-chain, we take pride in having built a robust retail network that has enabled customers across the UAE with their fuelling needs. Our operations will continue to evolve to meet the ever-changing needs of our customers, and we are deeply committed to remaining front and centre in a new era of digitised retail. “Our collaboration with Microsoft will enable us to transform motorists’ and customers’ experiences well before they roll onto the forecourt. By embracing new technologies and introducing novel ideas, we continue our journey towards supporting the Dubai 2021 Plan to become a smart city”, he added. The Service Station of the Future concept will harness the power of the intelligent cloud to build rounded views of Enoc customers and promote enhanced standards of safety, security and information on forecourts. Advanced machine-learning and AI technologies will use CCTV camera feeds, and data of all types, to manage the queuing and wait times in the forecourt, improve the availability of services and assets, and bring relevant marketing and advertising context to all customers – allowing them to avail the right products at the right time. Safety is a key focus as well as the solution helps detect hazards such as smoke, fire and seemingly abandoned vehicles. “Microsoft’s mission is to help every individual and organisation on the planet to achieve more,” said Sayed Hashish. “Our customers are the true digital transformation heroes – engaging customers, empowering employees, optimising operations and reinventing business models. As we move forward with Enoc on the Service Station of the Future programme, we have the opportunity to redefine the fuel retail experience, establishing Enoc stations not just as efficient service centres, but as enticing destinations for the whole family. “That is what digital transformation is all about; it enables organisations to position themselves at the forefront of innovation, by capturing, enhancing and modernising the end-to-end customer experience,” he added. The past few years have seen an increase in demand for cloud services across the GCC and wider MEA region. A Microsoft study found that more than 51 per cent of organisations in the Gulf identified cloud computing as a top priority for adoption in 2018. In March this year, the surge in uptake of its solutions and innovations led Microsoft to announce that it will deliver its trusted, secure and versatile cloud to Middle East customers from two new dedicated data centres in the UAE, one in Dubai and the other in Abu Dhabi.